Sand Pool Filter & Your Pool Filter System. 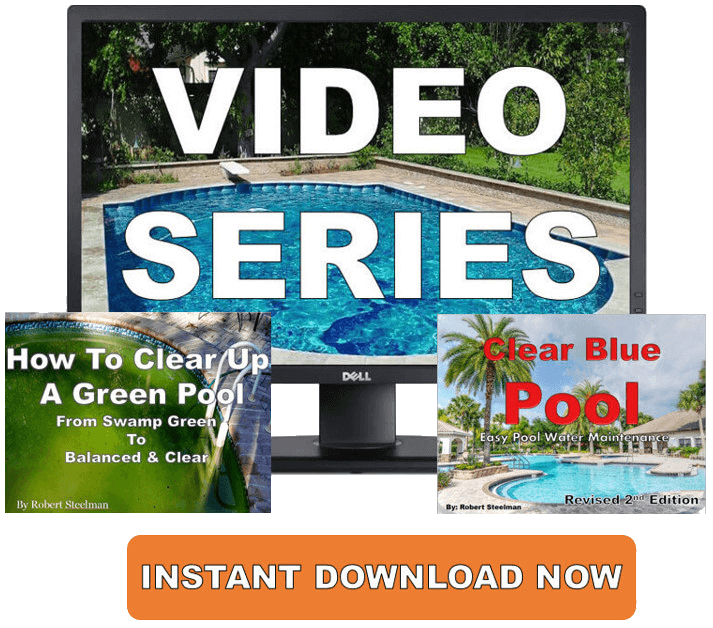 Learn Sand Water Filters For Inground & Above Ground Pools. Do you like things that are efficient? How about inexpensive? And low-maintenance? Then you're the right candidate for a sand pool filter. You spent the money and simply want your filter to do its job and that's filtering. They do the job and its very easy on your bank account. Now we're ready for the fun stuff. 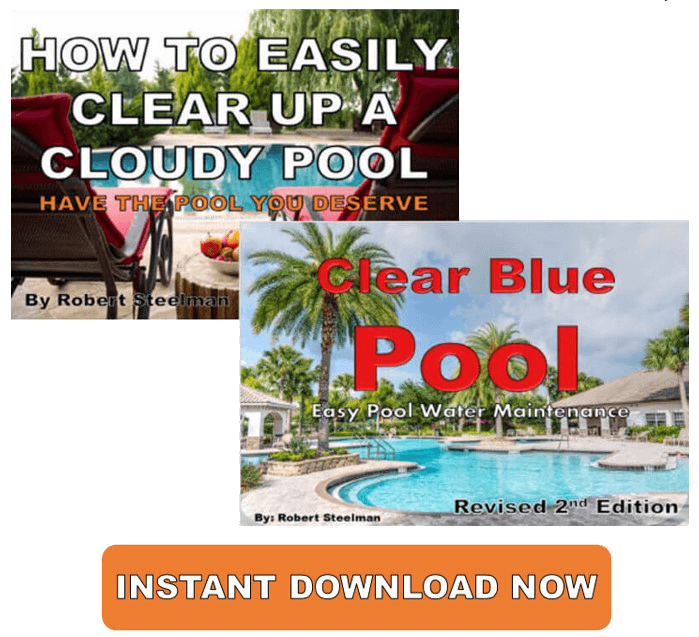 Understanding the basics of pool water maintenance fairly straight forward. However, if you're the least bit unsure about maintaining or backwashing your sand filter, it's best to call in a professional pool tech. Before making any adjustments or turning any valves, be sure the pump motor is OFF. Many pool systems will have what is known as a “Multiport Valve” or MPV. 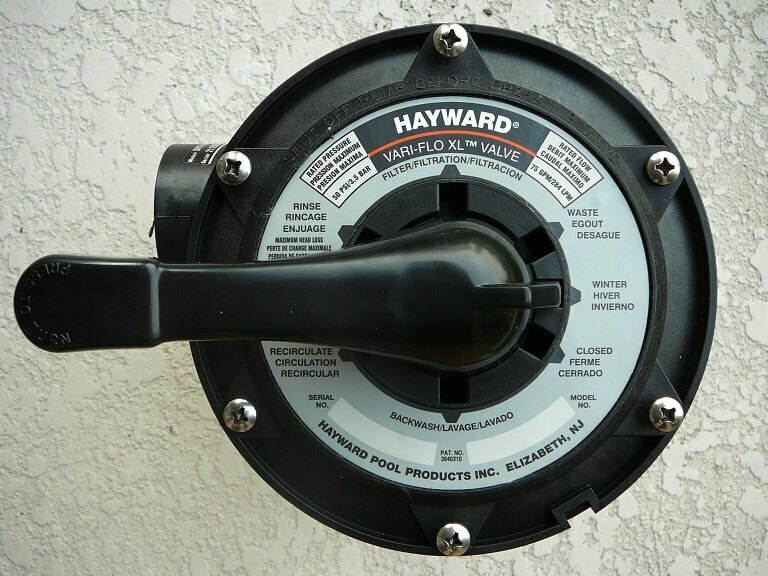 This valve is an all-in-one valve that makes your pool life a little easier. If you're not familiar with a MPV please read the following and consult your owner's manual. If you're pump motor is on and you decide to start turning any valves, well, that would be bad. 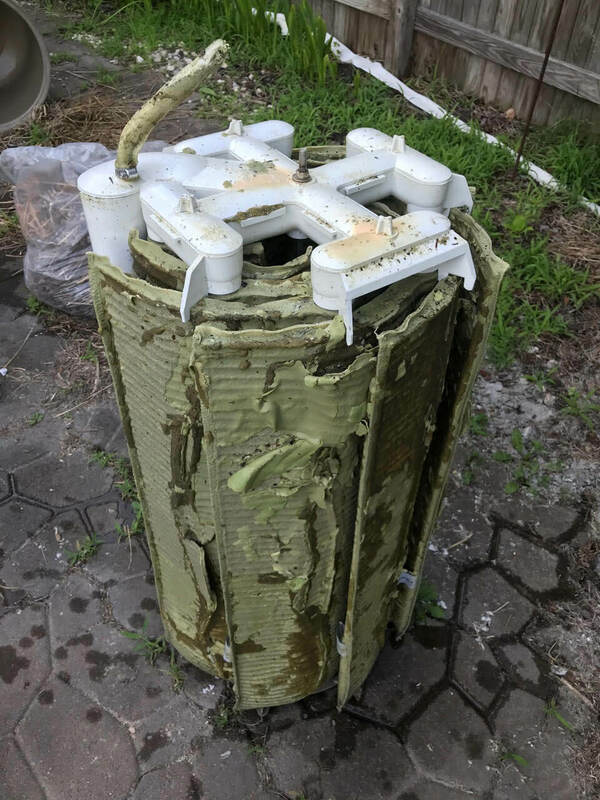 So be sure the swimming pool pumps and filters are off before turning anything. 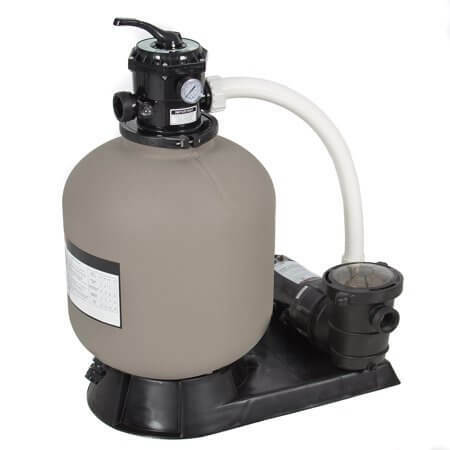 Sand Filter Problems - Pool Sand Filter Problems & Sand Filter Maintenance & Troubleshoot Pool Filter Sand Issues. Pool Sand Filter Maintenance - Pool Sand Filter Maintenance & Pool Filter Problems. Swimming Pool Sand Filters - Understanding Swimming Pool Sand Filters, Swimming Pool Filter Sand, & Your Pool Filter System. Above Ground Filters - Choosing above ground swimming pool filters can be an issue, but which one to choose. DE Filters - Your Swimming Pool Filter System & Swimming Pool Pumps and Filters. 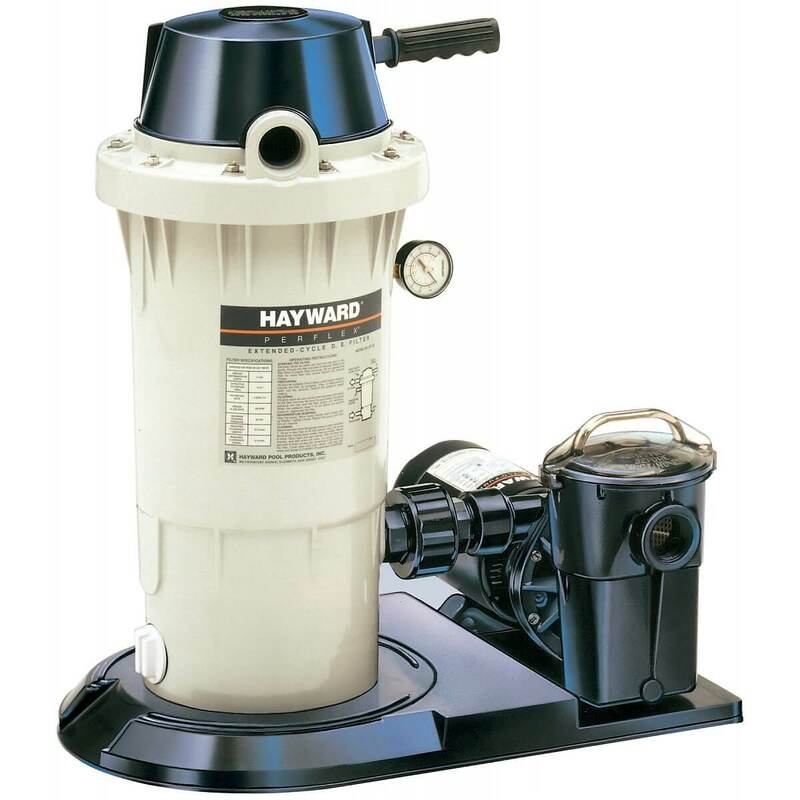 DE Filter Maintenance - Easy DE Pool Filter Maintenance & Pool Pump Motors. As with anything in life, there are variables. A heavily used pool will require more backwashing than a lightly used pool. When you backwash depends upon your unique situation. But as a general rule, you'll want to backwash when the pressure on your sand filter's psi gauge is 8 - 10 lbs. over the "just backwashed" or normal operating pressure. This means if your sand filter normally runs at 8 psi the you'll want to backwash when the gauge gets to around 18 - 20 psi. This is the normal setting for the valve. The pool water is drawn through the pump, passed through the filter, and is then returned back into the pool as clean water. 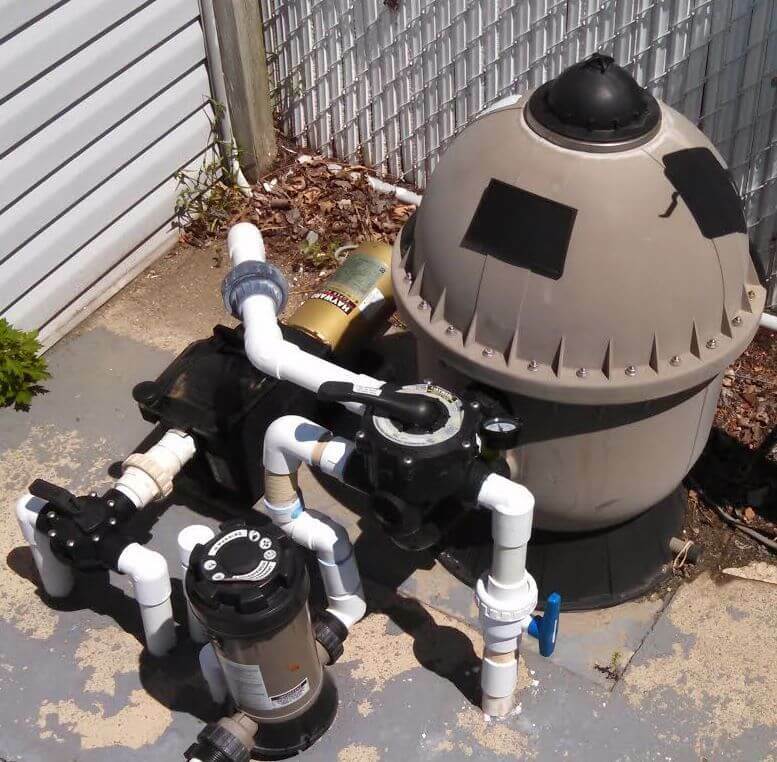 Once this part of your swimming pool sand filter maintenance is accomplished your system is ready to rinse. DE pool filters will need to recharge your grids with fresh DE. This setting is used to flush out any dirt, debris, or excess pool filter sand that may remain in the lines after backwashing and only requires about 10 seconds. This water then exits as waste and not back into the pool. This function allows for the pool water to circulate without passing through the swimming pool filter sand again. To be used when chemicals need to be mixed in the pool. 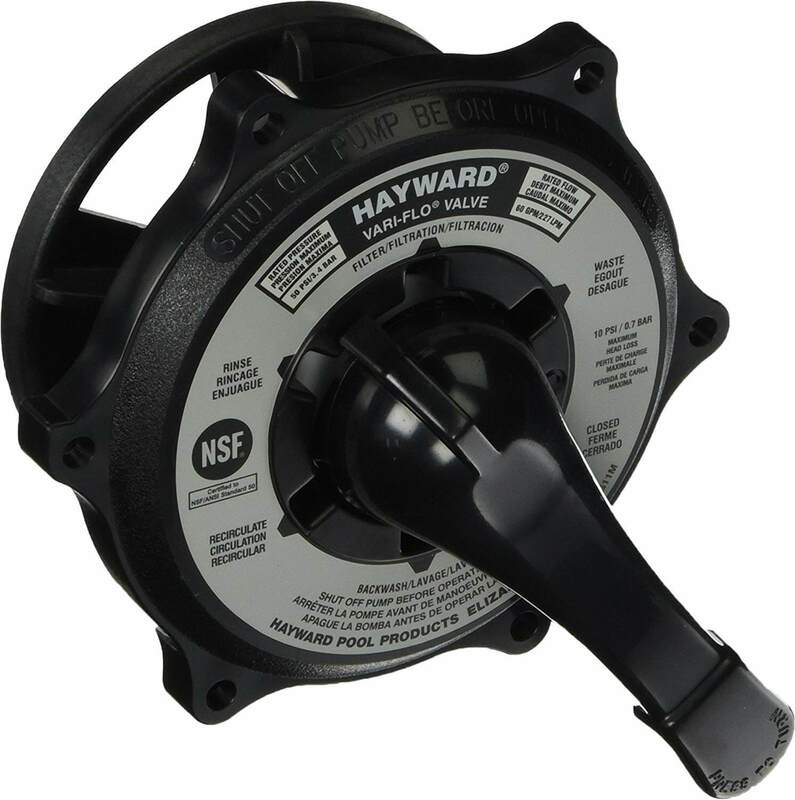 This setting runs water from the pool directly to the drain and can be used when lowering the water level, when certain adjustments are needed, or when vacuuming large amounts of dirt. This setting is to be used ONLY when the pump motor is off. Closing this valve while the pump is running could seriously damage your pool water sand filter. If you have any questions or are not sure about the Multi-Port Valve or any part of your sand water filters, check with your local pool store and find a qualified pool technician. Backwashing a sand filter is an easy process that take just a few minutes. It's done by reversing the flow of water back through the filter in the opposite direction sending the dirty water to waste. Raise the water level 1"-2" if it's low. Turn off the pump motor and clean the pump basket. Check it for cracks and replace if needed. Remove any debris and carefully place the basket back into the pump housing and reattach the pump lid. Set the control valve to RINSE and turn the pump on for about 10 seconds. Turn off the pump motor. This will get rid of residual sand left in the lines. 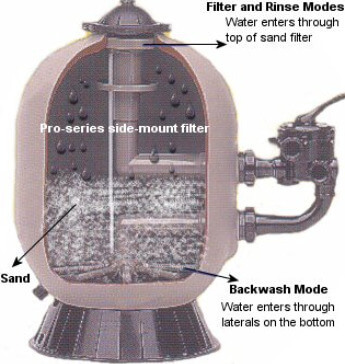 The entire process of backwashing your sand pool filter should take about 5 minutes. Sand pool filters are the most widely used types of filters in the world and are perfect for any type of home or commercial pool. Yes, they do require some periodic maintenance, but that seems to be part of life. Taking care of your sand filter should become part of your regular pool maintenance schedule. Keep an eye on your sand filter's pressure and backwash when needed. Having a properly working sand pool filter is one of the keys to a perfect pool all swimming season.